At the beginning of each Turkey call review I do, I'm going to make the following disclaimer: I understand that how much one likes a particular Turkey call may be a very subjective thing - what I aim to do in this review is to tell how I liked or disliked the call. I really, really like the Ol' Timer. In fact, there's nothing about the Ol' Timer that I didn't like. 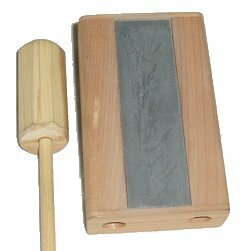 It's a slot style box constructed of cedar, with a cedar knob on a hickory dowel for the striker. The surface is slate. This call makes a wide variety of sounds and really has a nice sound quality with rich tones. It's best for close-in, finishing type work. You can get some volume out of it, but it is at it's best with soft to medium volume sounds. Purring on the Ol' Timer is really fun - it's easy and it sounds beautiful. It also makes great yelps, clucks and cutts. The Ol' Timer is a sturdy, very attractive call, and because of the cedar construction it smells pleasant too. It's light and packs quietly. What else is there to say? I love it. It will go with me on every hunt this Spring.